Since Sunnyboy and Nexus 6 did all the coding and left the graphics part to me. I felt the need to code something for myself. So I decided to do a project on my own. The whole demo is not exactly what you would call stunning, but the process of coding this demo improved my coding skills a lot. Since I had problems with my electrical equipment on new years eve, the demo had been finished on Jan. 2nd 1990. You can read the details in the scrollers. I hadn't intended to release it to the public, but I gave it to some friends and so it happened that this little demo had been spreaded. It had been included in some compilation disks like POV (Persistance of Vision) disk 99. The demo is called "Trolls New Year" there, you can download the POV disk 99 from PaciDemo. The demo consisted of 6 screens which had been done in a hurry. Above you see the welcome screen. The lower border had been removed. There was palette animation (wow), a horizontal distorted Troll logo (that looked like hell). Besides there had been a XY-distorted Cyclone logo and some sprites. This is the main menu, I think it's the best screen of the whole demo. There is a lot of movement on the screen and I still got all the blue rastertime left. I simply didn't know what to add because I had been satisfied with the result. 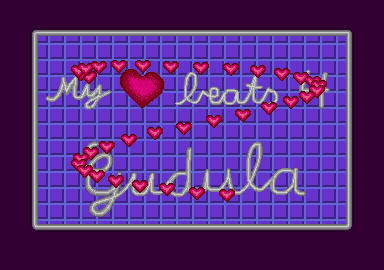 The picture above shows the greetings-screen. Instead of naming all the crews in the scroller I cracked their demos and ripped the needed logos to send the greetings in a different way. The lower border had been removed. There is a scroller, a disting text, some sprites and a synchronized Troll-logo that fakes an overscan in the upper screen. The hall of fame should be called the hall of shame. It's a lame screen with some nice looking rasters and sprites. I had some serious problems with movem and timer B at that time. It's a very old screen which should have been the hiscore-list for our abandoned jump and run game. Well what should I say, Sunnyboy and Nexus 6 nearly killed me when they saw that screen :-) but, the girl mentioned in that screen is still my girlfriend (since 1987) and we have two very nice children today. There is a reset Demo hidden behind this screen, which reveals some interesting but maybe dangerous effects. To force the anxious guys to switch off their computers the scrolltext in that reset demo isn't very nice. 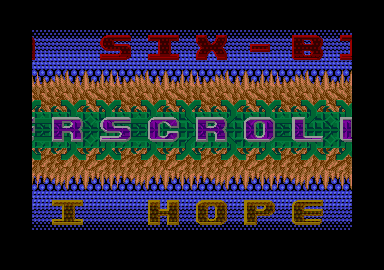 The effects are activated by pressing some keys at the end of the scrolltext. I guess you have never seen your drivelight illuminated to this brightness before. Unfortunately you won't see that on any emulator. Don't use the screen killer, it's really dangerous on real hardware. The picture in the reset demo was ripped from the game "Teenage Queen" and it was "improved" a bit :) by me. The joke on that thing is. I wanted that picture from the TCB loading screen when I saw it. And because I didn't own that game, I began to hack into the Cuddly demo when one day later some pal from the university dropped a pile of disks on my desk. Guess, which game was on one of those disks. It would have saved me some work if he came up with it one day earlier. 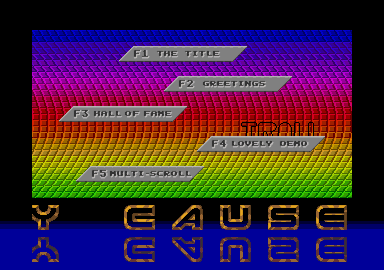 The Multiscroll is a cover of one of the Union Demo-screens, but this one comes with 6 bit samples generated by the crappiest hardware ever (sounds like hell). It had been my 1st and last attempt to produce sound on the ST. When I coded this screen I thought I had beaten the Union, but that's certainly not the case. Yes I play a crappy sample yes I have two more scrollers, but I can't change the speed of the scrolltexts. (You can change the speed and direction of the three background layers with Numpad 1-3 to select the layer and cursor left/right to increase/decrease the speed afterwards) It would be not problem on a ST with one megabyte to include the variable scrollspeeds, but it is a problem on a half meg machine. If you want to take a look at my very first demo, just download the Cyclones New Year Demo 89/90.